Charles Stanley, not to be confused with the minister from Atlanta, lived in Abilene, Kansas and was in the entertainment business all his life. The opportunity presented itself for him to first rent and then purchase the so-called “Death Car” of Bonnie and Clyde. For many years, Bonnie and Clyde were prominent figures in the news and the public picked up on their story along with other outlaws of the day. One theory about why the criminals like Bonnie and Clyde, John Dillinger, Pretty Boy Floyd, Machine Gun Kelly and others were so popular in America during the depression was that the banks they robbed were also taking away farms and homes of Americans. In any event, daily newspapers covered their activities and they were viewed as the celebrities of the day. Bonnie and Clyde met their fate on May 23, 1934 when they were ambushed by law officers in Bienville Parish, Louisiana where they’d traveled to allow a gang member named Henry Methvin to visit his family. Unknown to the group, Methvin’s father and made a deal with the authorities to identify them when they stopped at a rural location to meet. The gang was driving a 1934 Ford DeLuxe V-8 that had been stolen in Topeka, Kansas a month earlier. True to the agreement, when they stopped, Methvin’s father pointed out the outlaws. Lawmen including Texas Rangers came out of the woods, shooting the car full of 160 bullet holes with at least 50 bullets reaching the bodies of Bonnie and Clyde. Stanley and lived much of his life in Abilene, Kansas. He’d wanted to be an entertainer himself after having played in the high school band and having grown up enjoying the local theatrical productions. His father had owned a carnival, so this life was natural for him. He was also an excellent sign and banner painter. In time, he organized a carnival of his own and supported his family by taking it around the area, supplementing the activity by giving lectures for NACA. After making the arrangement with the Warrens, Stanley toured the area for four years before purchasing the car from the Warrens. His lectures would reveal the Death Car and show slides of other similar incidents. He also was featured on radio programs and became known as the Crime Doctor. For a time, Stanley was able to persuade Bonnie’s mother Emma Parker and Clyde’s mother Cumie Barrow to join his lecture tour after they were released from jail. The Depression was still in full force and this allowed the family members to earn some income. At times, the troupe also included Henry Barrow and the father of John Dillinger. Marie Barrow and husband Joe Bill Francis also toured with the group and were employed to handle ticket sales. One incident is recounted when Stanley and the group reached Austin, Texas. Stanley was confronted by Texas Ranger Captain Frank Hamer who objected to Stanley revealing the identity of the informant Methvin. Hamer is reported to have had a physical confrontation with Stanley and confiscated his slides, warning him to stop putting on his shows. Undeterred, Stanley continued his tour with a duplicate set of slides. Stanley was concerned enough that he hired two security guards (Bob Alcorn and Ted Hinton) when he exhibited the car at the 1939 State Fair of Texas in Dallas. He was prepared for controversy, but was not again confronted by Hamer. 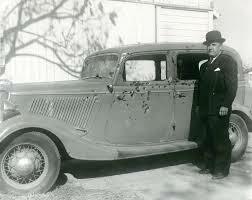 By the time he retired from touring, Stanley had lectured with the Bonnie and Clyde car in all 48 states. For a while, he also brought with him one of the various former getaway cars belonging to John Dillinger. The Dillinger cars were known to be reinforced and armored and though Dillinger favored the Hudson Terraplane, it is not known which exact car was used in the tours. Stanley continued to tour with the car until about 1941 when he took a job with the Coney Island Amusement Park in Cincinnati, Ohio as director of special events, a job he would hold until his retirement in 1973. While he was employed there, the Death Car was exhibited at the park until about 1952. Interest in the exploits of the gang had gradually declined over the years and the car was placed in storage until Stanley sold it to Ted Toddy who owned it until about 1973. In the interim, the feature film “Bonnie and Clyde” was released in 1967, leading to a resurgence of interest in the lives of the gang, and the car was sold to a casino in Nevada, possibly in 1988, this time for $173,000 and many times more than Stanley had sold it for. Stanley continued to lecture without the car for a number of years until he passed away in Kansas in 1996. There are a number of cars that reference the Death Car (even one in Gunter, Texas) but the actual vehicle is believed to now reside at Primm Hotel and Casino in Primm, Nevada.